A time series of the net geostrophic transport through the Tasman Sea (representing the flow of the East Australian Current (EAC) Extension) is determined from a full-depth CTD section, 15 years of high-density XBT transects, and satellite altimetry data. A section between Sydney and Wellington (PX34) has been occupied four times per year since 1991 with high resolution XBT sampling. 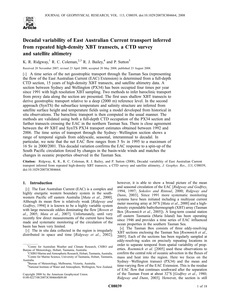 Two methods to infer baroclinic transport from proxy data along the section are presented. The first uses shallow XBT transects to derive geostrophic transport relative to a deep (2000 m) reference level. In the second approach (SynTS) the subsurface temperature and salinity structure are inferred from satellite surface height and temperature fields using a model developed from historical in situ observations. The baroclinic transport is then computed in the usual manner. The methods are validated using both a full-depth CTD occupation of the PX34 section and further transects crossing the EAC in the northern Tasman Sea. There is close agreementbetween the 49 XBT and SynTS PX34 transport estimates obtained between 1992 and 2006. The time series of transport through the Sydney–Wellington section shows a range of temporal signals from eddyscale, seasonal, interannnual to decadal. In particular, we note that the net EAC flow ranges from 5 Sv in 1995 to a maximum of16 Sv in 2000/2001. This decadal variation confirms the EAC response to a spin-up of the South Pacific circulation forced by changes in the basin-wide winds and matches the changes in oceanic properties observed in the Tasman Sea.